Players anticipate the exciting chance to win a Hole In One Prize on each par 3 hole. Don't risk having to pay out of pocket if you have a winner. Contact GolfTournament.com to secure your coverage today. Simply provide your prize selections and expected player count. Each luxury package includes coverage for one Major Prize and three Bonus Prizes that are awarded in the event of a Hole In One. 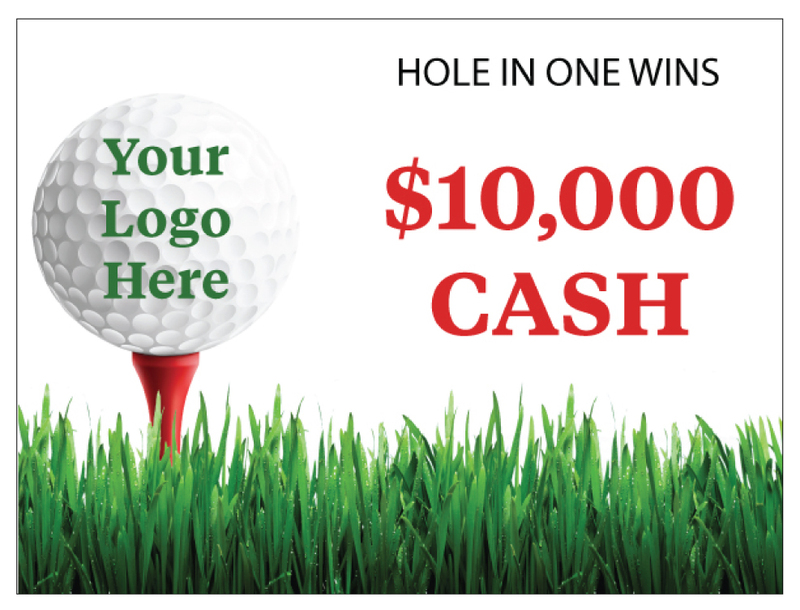 For only a few dollars on average per player, everyone in your tournament field will have the opportunity to win thousands of dollars in Hole In One prizes. Select one Major Prize to be associated with one par three hole at least 160 yards or longer for men (women may shoot from 15 yards less). Every player in your field will take one shot on this hole to try and win the Major Prize. All trips include lodging, airfare, tickets to event or rounds of golf, self drive transportation and some meals. Please call for details. *Simply contact us with the retail value of a vehicle, watch, boat or any other major prize you wish to offer. In addition to your Major Prize, every player will have the opportunity to win any three of the following Bonus Prizes. One of each selected prizes will be placed on each remaining par three hole. Every player in your field will take one shot on each hole to try and win the corresponding Bonus Prize. Hole In One Sponsor Tee Signs describing the prize associated with each hole are available to purchase with each package. Customize your signs with a sponsor name, sponsor logo or tournament logo.